Is Louisville more or less safe than it used to be? If you watch local television news, you’re more likely to think that Louisville is less safe. This is partially because the local TV outlets—WAVE, WHAS, WLKY, and WDRB—spend an extraordinary amount of time covering crime stories despite the preponderance of other, more newsworthy topics. Over one-fourth of all stories aired by local TV news stations are crime stories. TV news directors might give two rebuttals to this fact: first, that crime stories are newsworthy and ought to be covered by local journalists; second, that crime stories are simply easier to cover than other stories. I’ll cover the first response in this column and the second in a follow-up. What does “newsworthy” mean? It depends on who you ask, although all sources agree that news ought to first and foremost be new. News stories should also be relevant to their audiences. We don’t expect to read news about a traffic jam in Beijing on the front page of our local newspaper— unless it’s a truly epic traffic jam of historic proportions, the Olympus Mons of traffic jams, in which case the story’s uniqueness or novelty value might outweigh its lack of local relevance. An unprecedented Beijing traffic jam would also have another important factor in determining what’s news: drama and conflict. But missing from many definitions of newsworthiness is the concept of impact, or the number of people who are actually affected by the subject of the story. Grade the News uses what is, in my opinion, the best definition of newsworthiness: “whether the story is likely to have a direct and lasting informational impact on a wide audience.” By this standard, hardly any crime stories are newsworthy. Certainly there are instances in which crime stories are newsworthy. A rash of unsolved burglaries would qualify as newsworthy, as would a series of murders in any part of town—as long as they were treated as part of a bigger problem and not reported as isolated events. An actual crime wave impacts our entire community and ought to be treated seriously by the media, police, and local government. 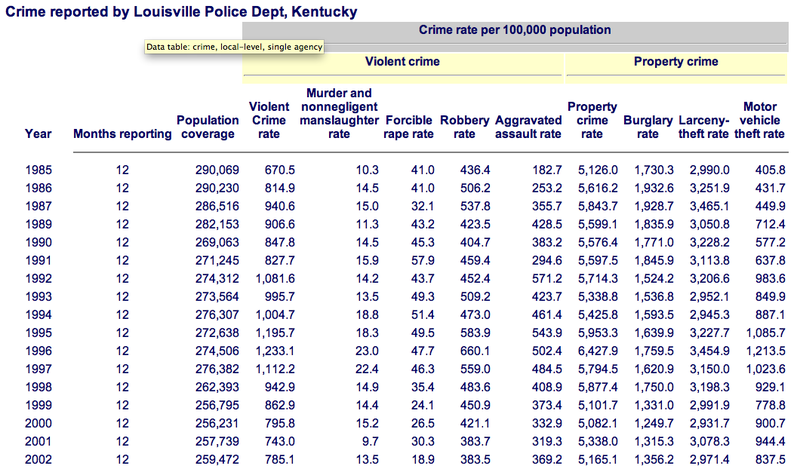 But crime in Louisville is much lower than it used to be. According to the FBI Uniform Crime Reports, violent crime in Louisville peaked in 1996 at a rate of 1,233 per 100,000 people. As of 2010, the last year for which full data is available, the rate is now 565 per 100,000. In other words, the violent crime rate has been cut in half in less than twenty years. The property crime rate has also dropped significantly, though not as much: from about 6400 per 100,000 in 1996 to about 4500 per 100,000 in 2010. Despite these facts, local TV news as a whole devoted over one-fourth of their news segments to covering crime stories in October 2012, and three out of four stations (WDRB was the exception) aired more stories about crime than any other subject. Remember that there was a national presidential election in full swing at the time, but only about 12 percent of their news segments were devoted to politics. Remember that American soldiers were still deployed in Afghanistan and Iraq at the time, but less than 1 percent of local TV news stories were about our nation’s wars. Remember that the nation was still suffering from the effects of the 2008 housing crash—remedies for which were a major issue during the election—but only about 16 percent of local TV news stories covered the economy. In other words, local TV stations spent about as much time covering crime as they spent on politics, war, and the economy combined, even though many of their crime stories were not truly newsworthy and Louisville was not experiencing a record-breaking crime wave. If it’s true that most crime isn’t newsworthy and Louisville isn’t (relatively speaking) a crime-ridden city, then why do local TV news stations spend so much time covering crime stories? In my next column, I’ll answer that question and let local TV news decision-makers speak for themselves. Read the second part of this column here. James Miller is WFPL’s media critic and a journalism teacher at duPont Manual High School.